I've made a lot of pies, but the first I learned to make was apple and it's still my favorite- so I was super excited to have the All American Apple Pie chosen as this week's Dorie treat. Dorie's version is exceptional (big shock, right?) and one of my favorite parts is the layer of graham cracker crumbs under the filling. It soaks up the excess juices and leaves the bottom of the pastry crisp (my tall man's favorite part- he loves the buttery, delicious dough). And even though preparing apple pie can seem a daunting task, my surprisingly practical apple peeler and corer came to the rescue once again. From my morning apple cinnamon oatmeal, to apples to snack on for my son, to apple pie- I use this thing all the time. You can even peel potatoes with it! Grab the recipe from Emily, this week's host, or buy the book here if you haven't already. Mine is tattered and covered in butter and flour- and it's been worth every penny! PS Guess what- my beloved camera is back! Nikon officially diagnosed the body with "sand damage" (but I think it's more likely flour/powdered sugar damage!) and they repaired it free of charge, even though I'm well out of warranty. Thank you Nikon , I'm yours for life! OO, it looks so delicious! And adorable. I have a Nikon too, dont know what I'd do without it. That is great news from Nikon! I worry about that would happen with my Cannon if it stopped working. 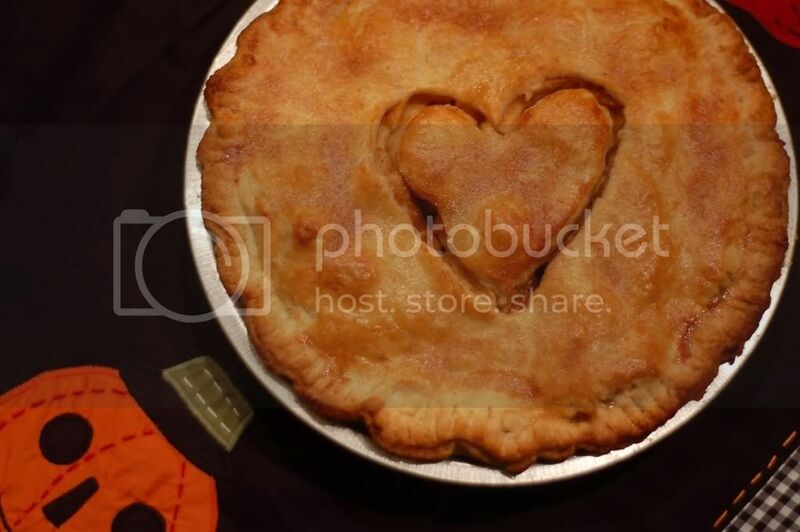 Love your pie! It looks delish. My husbands favorite part is the crust as well. What a pretty tart! i love the heart shape on it. And welcome back pretty pictures! That is a beautiful pie. Love the heart on top. Love apple pie and this one was delicious. You can tell you've had a lot of pie experience - your pie looks perfect. Glad your camera was fixed - I'd guess flour too (I'm sure the camera shop hasn't seen that before). Great looking pie! Your picture is cute! I bought the apple corer and peeler through your site and have been in love ever since. We are sure eating a lot of apples. Your pie looks lovely. =) Yay for the camera return! my nikon is well on it's way to being flour damaged as well! your pie looks great, and now i totally want one of the apple peelers! oh i love the little heart on top! Gorgeous pie! Love the heart vents. And I want/need one of those apple peeler/corers. I love apple pies a lot. Yours really looks so delicious. And the heart on the top is so adorable.